Stag do, bachelor party, smoker, call it what you will, when a group of guys get together and celebrate one lucky friends last days before tying the knot, it’s usually quite the bender. Throw the group into the town of Whistler and you’re usually guaranteed a scenario that leaves a path of destruction in their wake. 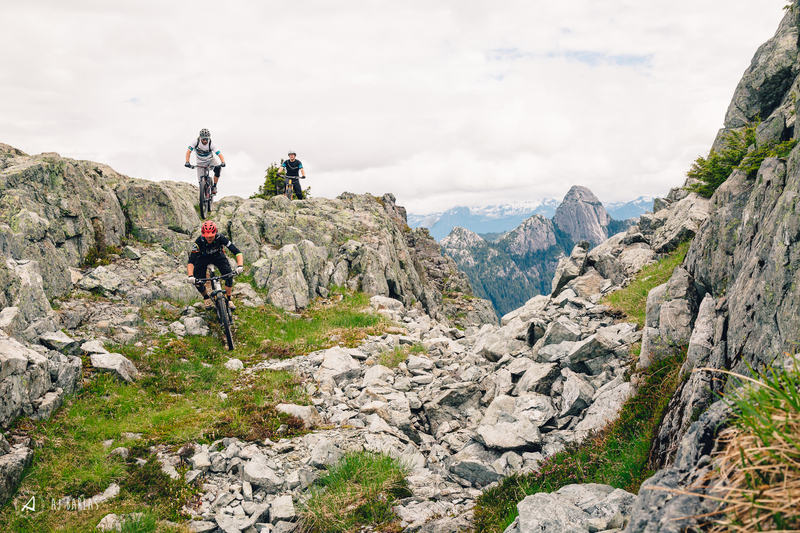 That’s what is commonly thought of anyway, but what if the group really wants to shred their bikes during the day only to follow up with a few cold ones and some laughs after making use of some of the best trails on the continent? A couple of weeks go by as we organize the drop, all the while keeping it quiet from the future groom. The whole secret almost came unravelled when the night before issues arose with the commonly used pickup spot, sending us on a wild goose chase the next morning. The adventure really began from this point on and included an angry, short tempered rock quarry staff member, multiple jaunts up and down the highway by Murrin Park, and spitting lies to the groom while riding in the tray of our pickup, with 9 bikes. Thankfully, Nate, the groom to be, was far too involved in the whole adventure to sit back and think about the fact that this idiot guide was supposed to know exactly where we were going. Shortly after realizing that the “f’n bird” buzzing by was in fact our shuttle to the top, Nate and the entire group began to foam at the mouth. A few nervous moments were spent taping up stanchions and shock shafts to protect them from damage in the uplift (thanks Nick! 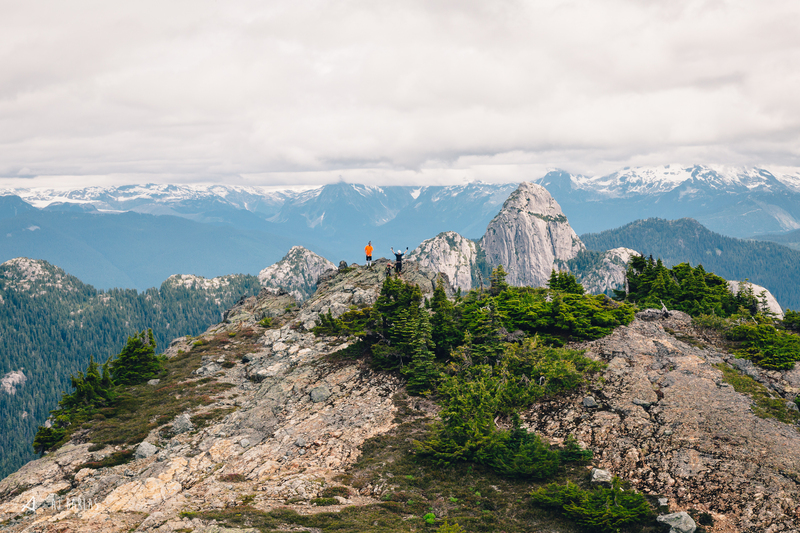 ), and before we knew it we were standing on top of Goat Ridge at roughly 1,600m with views of Squamish, the Howe Sound, and Mt. Habrick surrounding our north facing aspect. 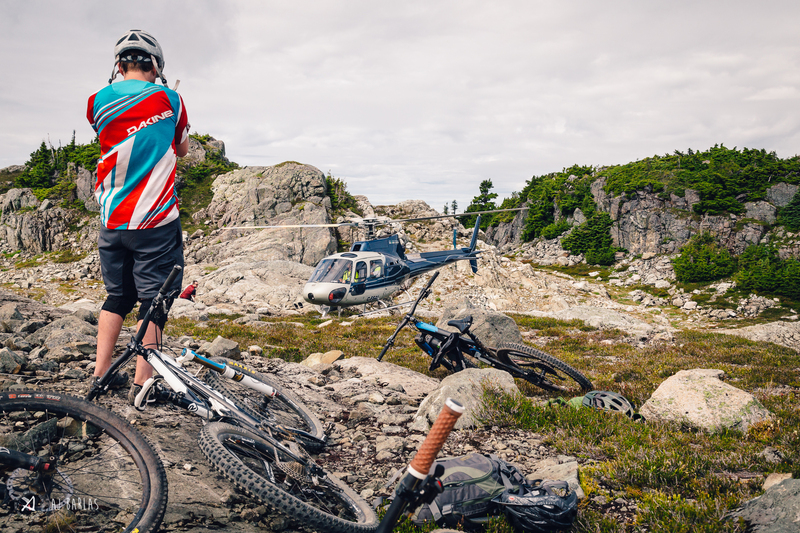 To top the heli experience off, we were treated to a bit of a show as it dove off the ridge line to the sounds of cheers and laughter, setting everyone in the perfect frame of mind to hike-a-bike for a little over an hour. 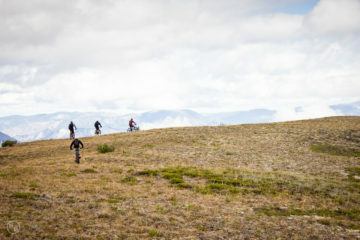 While there isn’t an awful lot of riding to be had climbing the remaining portion of the actual ridge, the vistas over each rise and general distinctiveness of the terrain would periodically result in gasps and cheering from the group, continuing the stoke despite not actually being able to have much fun on the bike, yet. After battling along the ridge line for an hour or so, we reached the final outcrops and broke for a feed. Stunning views of Sky Pilot, Mt. 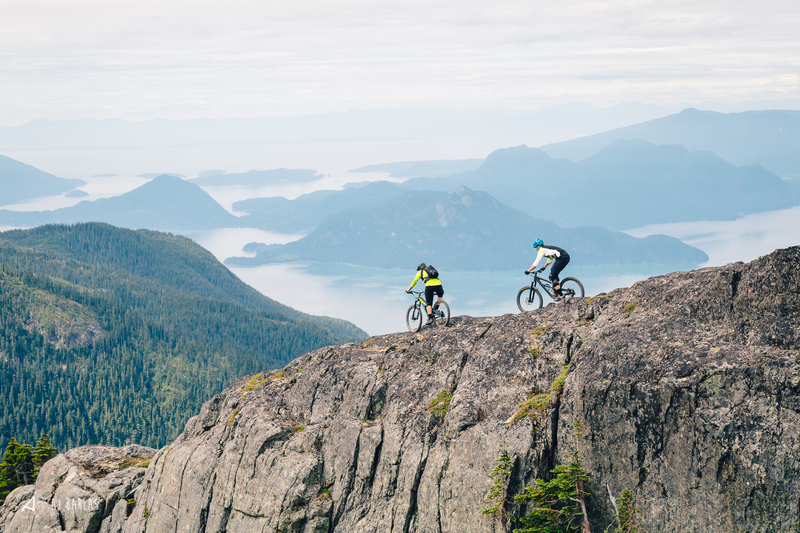 Habrick, Squamish, the Howe Sound and the backside of the North Shore Mountains, including the Lions, made it easy to pass time. A number of us decided to stroll down to the very end of the ridge to really seal the deal. Once fuelled and the bugs had found us, we began to head back from whence we came, riding a lot more as we were now heading down the ridge. However, within the first five minutes of descending we already had one slashed sidewall, followed very shortly after by another. The sharp volcanic shale of the ridge line was not shy in letting us know it was still raw and rugged, despite the soft, scenic views afforded from its surface. After the second flat, both of which were 29″ wheels, the group gingerly made its way toward the tree-line in an effort to conserve spares, especially given the ride had only just begun—that and we were out of 29″ tubes. Before being engulfed into the tree-line and some of the steepest riding in the Corridor, we stopped by the last lakes for lunch and a rest. The group had really only just completed the commute, with the best yet to come, but it didn’t matter, the whole crew was stoked and could have called it a day right then and there. Despite this feeling of fulfilment, everyone was excited and a little nervous of what they were about to dive into, and we mean dive, as the tree-line gives way to a steep, loose, brown ribbon that winds its way through rock, roots, massive trees and beautiful forest. Within minutes screaming, hooting, nervous hollers, and general excitement rang out from the crew, as the mountainside gave everyone a challenge or three to overcome. For general reference, Wade Simmons has been quoted mentioning that the terrain down from Goat has the steepest lines he has ever ridden. 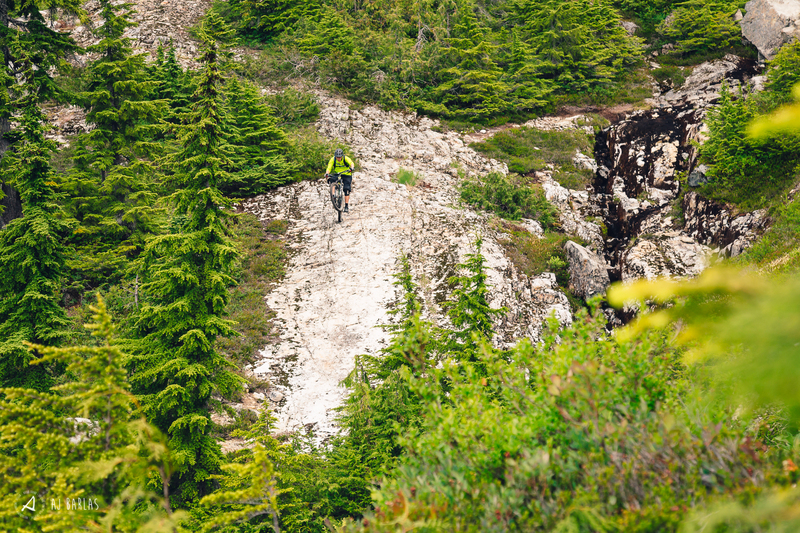 From where the tree-line begins to where the group dove into the first DR special, the descent covered over 400m of vertical in roughly 900m of riding. 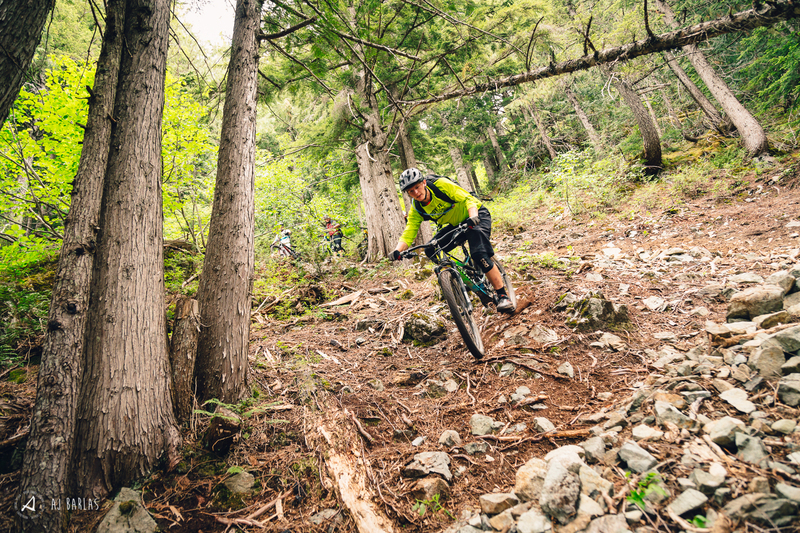 A number of times comments along the line of “F*$#k, this is ridiculously steep” were heard, only to be followed by laughter, then the squeal of discs. 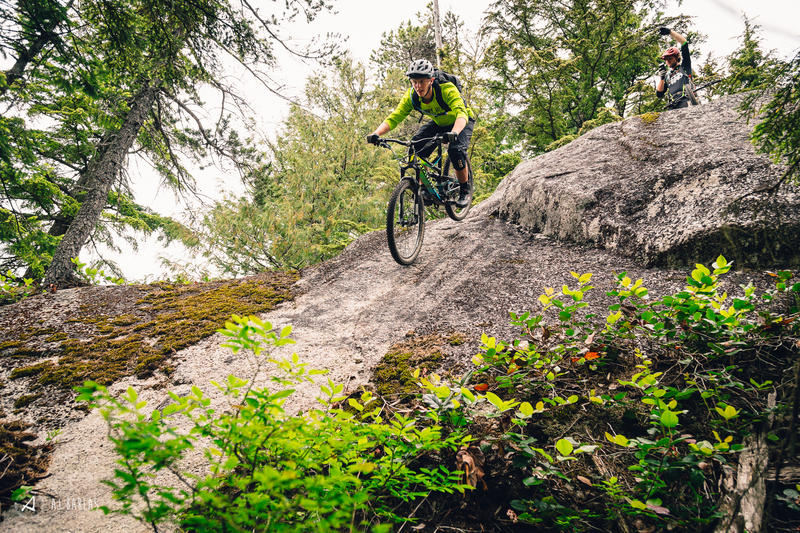 Brakes burned, bikes and riders were tossed, duff flew and smiles ensued, with everyone making it out of the ridge line descent in tact and ready to see what the Britannia network had in store. The ‘regular’ Britannia network started with a bang, dropping into one of DR’s latest creations. After making it through the upper portions, the boys were settling in well, but there were still some features to come that kept everyone on their toes, and truthfully, the descent off the ridge was the perfect warm-up for what lay ahead. 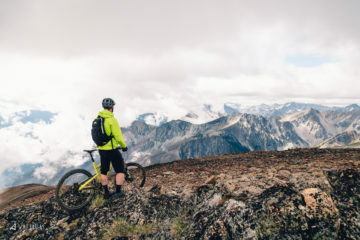 After ripping through steep lines and undulating loam, the group spat out on the FSR and headed back up a little to connect in with Tramp Stamp, where a break with another horrible view of the Howe Sound was taken. After blasting down the Tramp, the crew shot into Chuck Norris—but not before missing the turnoff and walking up and down the road in search of it again (thanks Pat!). Chuck Norris threw some curve balls at everyone and as riders began to fatigue the enthusiasm slowly faded. Good times were still had but if not feeling on your game, well, Chuck Norris is no-one to mess with as everyone knows. From Chuck the crew were told there was one more cruisy trail down and the day was done. Bitter sweet, but Half Whip is plenty long enough to still tie over probably the most energetic of riders. After copping some lip for what is considered “cruisy trail” in this part of the world, the team spat out onto Copper Drive, high on life, giggling, and thirsty as a herd of camels—the owner of the Britannia General Store didn’t know what hit him, as ice creams and bottle after bottle of supplement drinks and water were purchased to refuel the thirsty herd. While more stags in Whistler leave a trail of destruction throughout the resort’s hotel rooms and night clubs, this group of mates from Colorado left a couple of skids on a hardly ridden mountainside, flew in heli’s and will remember the adventure and once in a lifetime experience of Nate’s trip to Whistler for a long time to come. 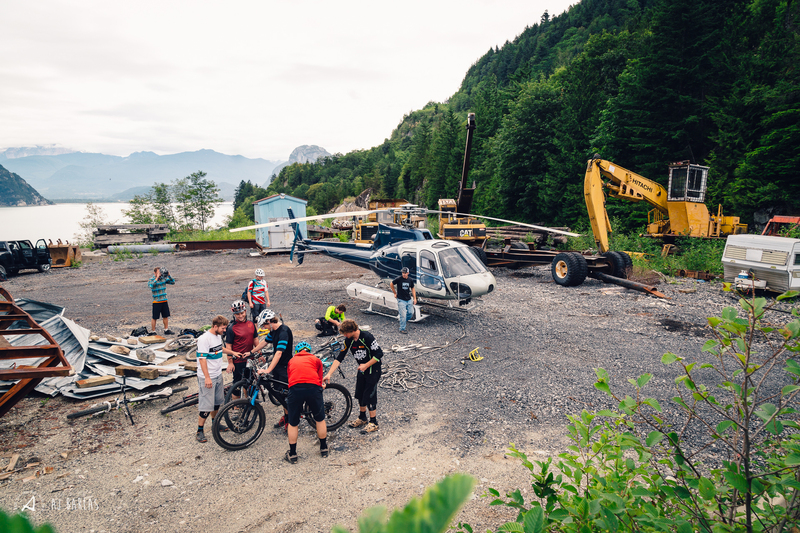 Squamish blew minds, and not just because of a helicopter shuttle, but it sure didn’t hurt to include it. Congratulations to you both, Nathan and Sara. 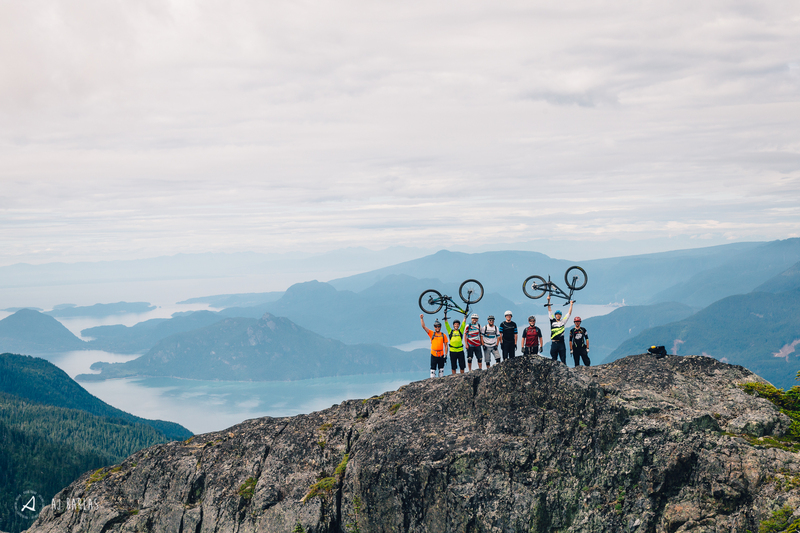 I know the special day will top the experience on Goat Ridge, and in Whistler in general. You’ll just have to head back together to share it in the future. Big ups to B for organizing it as well—what a sick day!